Pictured here is a map of the Partition of Africa. Photo courtesy of Stuart Rankin via Flickr Commons. The Scramble for Africa began with the Berlin Conference (1884–85) and ended by the early twentieth century. During this period, European colonizers partitioned Africa into spheres of influence, colonies, and various segments. They partitioned land from European capitals, with limited knowledge of the geography, history, and ethnic composition of Africa. In many African countries, a significant portion of their population belongs to groups split by colonial partitions. During the onset of colonization, European powers preferentially dealt with African local leaders and chieftaincies. Colonial powers employed underhand mechanisms in territorial acquisition and boundary making such as deceit, fraud, intimidation, and bribery. Moreover, colonial powers utilized various techniques to influence African leaders and obtain resource rich land. The Berlin Conference legitimized the partition of Africa; colonialists designed regional maps without providing any notification to the local African rulers, and made treaties among colonial powers to avoid resource competition. 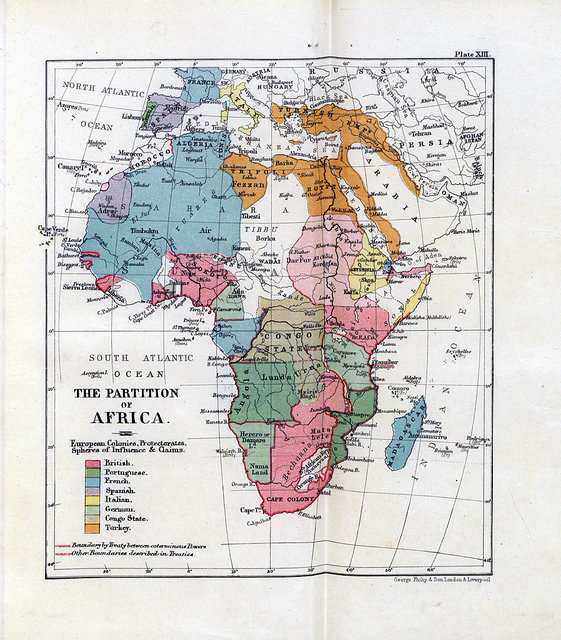 However, many errors were made due to their superficial knowledge of the continent and undeveloped maps in existence. Lord Salisbury, the British Prime Minister in 1906, demonstrated this arbitrary and under-informed approach at the signing of the Anglo-French convention on the Nigeria-Niger boundary in 1906, when he said: “We [the British and the French] have been engaged in drawing lines upon maps were no white man’s foot ever trod: we have been giving away mountains and rivers and lakes to each other, only hindered by the small impediments that we never knew exactly where the mountains and rivers and lakes were.” This statement helps us to understand how colonial powers designed artificial African boundaries without knowledge of the land and local communities. European powers completed cartographic surveys of territories through boundary commissions from 1900-1930, which allowed total control of colonies. However, these focused solely on land control and disregarded the impacts of partitioning on ethnic groups. Artificial borders split many closely related ethnic groups into different colonial regions. In the Horn of Africa, for instance, they split Somalis into French Somaliland, British Somalia, Italian Somalia, Ethiopian Somalia, and the Somali region of northern Kenya. Such colonial borders have massive effects on Somali people who share a common culture, a similar way of life, and the same religion, but live as separate citizens of Ethiopia, Djibouti, and Kenya. Similarly, the Afar people of Ethiopia were split amongst Ethiopia, Eritrea, and Djibouti, and the Anyuaa and Nuer were split between Ethiopia and South Sudan. Improper border design and the partitioning of ethnic groups have contributed to underdevelopment, and instability in African states. In addition, the disconnect between center-periphery relation demonstrated by the exclusion by some. African states of borderland communities in economic development exacerbate the challenges. The lack of economic, social, and political development and limited upward mobility expose the borderland communities to a number of human security problems, including widespread poverty, lack of infrastructure, limited education, and cross-border intergroup conflicts. The improper design of African borders and use of these designs as political instruments have increased instability and underdevelopment for borderland communities across the continent. Tasew Gashaw is a current Southern Voices Scholar Network for Peacebuilding. Jeffrey Herbst, “The Creation and Maintenance of National Boundaries in Africa,” (International Organization, 43, no. 4, 1989), 673-92. Lord Salisbury quoted in Anene, J.C, The International Boundaries of Nigeria, 1885-1960 (London, The Framework of an Emergent African Nation, Longman Press, 1970), 3.